This is a medium size (16 inches high by 42 inches wide) medium to dark green leaved species of hosta that originated in Japan and was first described by Dr. Fumio Maekawa in 1940. 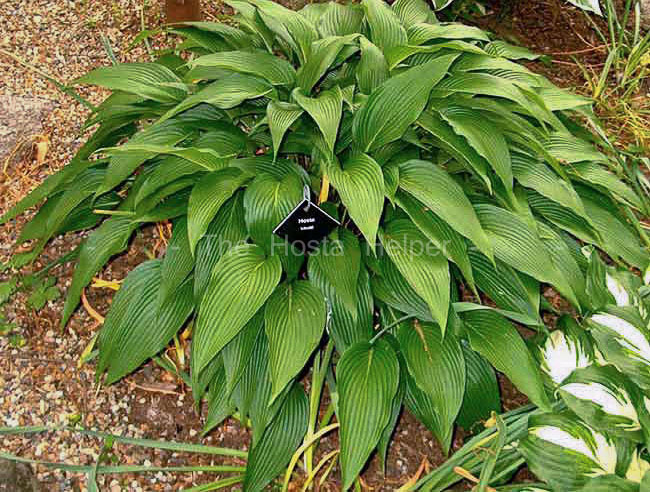 It has a medium to fast growth rate compared to other species hostas. The leaves are shiny and narrow with lightly rippled margins. It forms a "beak-like" bract around the flower buds and bears clusters of near white flowers with purple anthers from late August into September. They produce viable seeds. According to The Hostapedia by Mark Zilis (2009), "It is one of the four most common species found in Japan, H. montana, H. sieboldii and H. longipes being the others." And this species "...makes an attractive mound of shiny, green foliage with an outstanding late-season show of lavender flowers...several botanical forms with H. kikutii caput-avis and H. kikutii yakusimensis being the most common in hosta collections." Another form is H. kikutii tosana. 1) H. tardiflora × self Tends to flower 2 weeks earlier. 90% of the progeny have the flowers secund (flowers all on one side of the bloom stalk) and in 10% they are evenly arranged around the central axis of the raceme (nonsecund). 2) H. rupifraga × H. tardiflora Beautiful very tough plant with a taller bloom stalk. Blooms 2 weeks earlier. 3) H. 'Maruba Iwa' × H. tardiflora Taller bloom stalk. Blooms 2 weeks earlier. 30% of progeny have nonsecunded flowers. 4) H. gracillima × H. tardiflora Very nice small plant, with leaves intermediate between the two. Beautiful flowers. 5) H. rupifraga × H. kikutii The best of this cross is called 'Roys Pink'. It is a perfect intermediate. The leaf is long, heart shaped and very thick. The flowers are pony tail in type, a light pinkish color and spent flowers drop off cleanly. Dr Ralph (Herb) Benedict in The Hosta Journal (1992 Vol. 23 No. 1) discusses three forms of H. kikutii brought from Japan in the Minnesota garden of Hideko Gowen. Herb wrote that "...in 1982 she obtained the yellow edged one, H. kikutii 'Kifurkurin' - it was labeled H. kikutii 'Variegata'. 'Variegata' is an invalid name from Mr Negishi. The plant has leaves eight inches long by four inches wide. The leaf petiole is one and on-half to two times as long as the leaf blade. It has a chartreuse margin about one-fourth of an inch wide and a center which is a medium green. The bloom stalk is short and erect with a typical bird-head shaped bud. It blooms in late August in Michigan with pale-lavender, wide-flared blooms....All three of these plants have wavy leaves and variegated edges - they are jewels in any hosta lover's garden!" 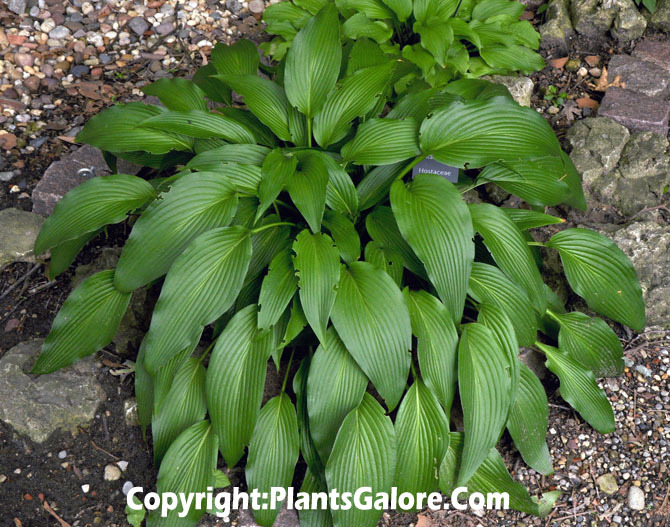 An article about favorite flowering hostas by W. George Schmid in The Hosta Journal (2006 Vol. 37 No. 2) says, "The best flowers are on H. plantaginea and its multi-petalous cousins, 'Venus' and 'Aphrodite'...H. capitata in bud is fine, but its offspring, 'Nakaimo' has flowers that begin with the shine of precious porcelain and stay closed in bud longer...H. kikutii forms all have fine and late flowers, but the best are on H. kikutii var. densa (H. densa). They are white and form a tight bunch at the top of the scape. H. laevigata has large, spidery flowers in abundance; its cousin H. yingeri has smaller ones with the same spidery character and dark color. These spidery flowers are carried all around the stem unlike other hosta flowers that, "lean to one side...Finally, mature clumps of 'Blue Angel' and 'Elegans' have a beautiful flower display when many flowers on different scapes open in unison..."
Mark Zilis' Field Guide to Hostas (2014) states that this species was found in Japan in "...in rocks, riverside..."